The best running pants can help you run comfortably in all types of weather. A variety of designs offer characteristics that do everything from keeping your muscles warm and dry to compressing your lower body. Running pants can also be stylish and fun, with a wide range of colors and styles to select from. When shopping for running pants, it's important to choose pants with some synthetic material, as 100-percent cotton pants hold moisture, keeping sweat close to your body. If your skin stays wet in cold temperatures, you are more likely to feel cold and uncomfortable; you are also more at risk for hypothermia. Synthetic materials can wick moisture away from your body, helping you stay dry and warm when you run. Look for fabrics with polyester and Spandex, with features that include moisture-wicking. Runners often wear running tights in cold weather. Running tights are form-fitting pants, usually made of a mix of materials, including Spandex. Tights come in a variety of thicknesses, with heavier ones offering more warmth in cold temperatures. A lot of running tights also offer compression features, which can make the wearer look slimmer. Several lengths of running tights are available, ranging from shorts and capris to full-length pants. 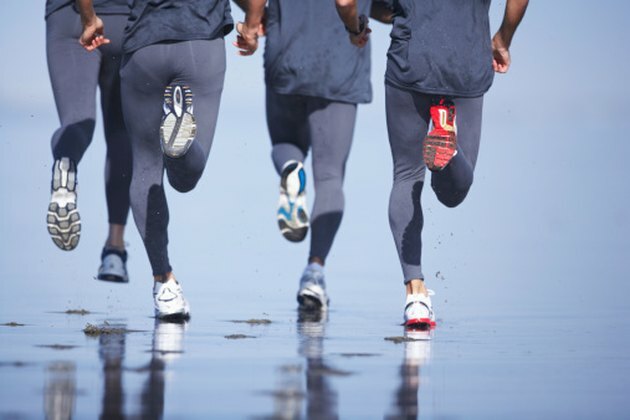 Running pants can range from heavy to lightweight warm-up pants. For milder temperatures, you can find light pants that offer breathability with features such as mesh for ventilation. Some lightweight pants are suitable for warming up; they feature snaps or zippers down the sides so you can quickly take them off before a workout or race. Heavier running pants include thermal pants, which offer heavy, moisture-wicking fabrics to battle cold temperatures. Running pants come in all shapes and sizes, ranging from petite lengths to extra-long. Flexible materials and elastic waist features allow running pants to easily conform to any body type. Running pants come in a variety of colors and styles, ranging from black and gray to bright red and dark blue; multi-colored pants are available, too. Some pants feature logos and designer touches as well. Running pants designed for nighttime running can include reflective patches or stripes. Some running pants also have small inside pockets for keys or an ID, and some feature zippered pockets so you can keep your personal items secured.